The 2011 United States Mint America the Beautiful Quarters Silver Proof Set™ marks the second of two annual sets released by the US Mint in 2011 to contain 90% silver coins. 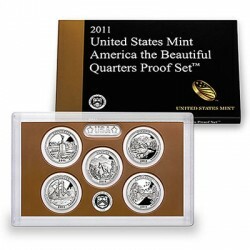 The US Mint released the Silver Proof Set on April 1, 2011 for $41.95. This was an increase of $9 from the $32.95 price initially charged by the Mint for last year’s set. Even though the 2011 version contains the same number of coins, the price of silver has increased dramatically since last year. So much so that the US Mint raised the prices on both sets in March. When first announced, the 2011 set was scheduled to launch at $39.95. The 2010 set went up $7 to $39.95. All of the coins in the 2011 America the Beautiful Quarters Silver Proof Set are struck to proof quality at the US Mint’s facility in San Francisco, and are generally collected for the numismatic qualities. However, since the proof coins are all composed of 90% silver, the set also has an intrinsic melt value equal to the current spot price of the 0.904 ounces of the precious metal contained within it. The US Mint Quarters Silver Proof Sets are a popular annual offering. As an example, the 2010 set saw sales of over 210,000 in 5 1/2 months of availability. As a brief background, under the America the Beautiful Quarters Program there are five new quarters released annually from 2010-2021. Each of the America the Beautiful Quarters contain a reverse design emblematic of a site of national interest from around the United States. One site was selected from each state, the District of Columbia and the five U.S. Territories for a total of fifty-six new coins. Continuing a quarter dollar tradition that dates back to 1932, the obverse of each coin still showcases a portrait of the first President of the United States, George Washington. In fact, the same portrait has been used on the quarter dollar in one form or another ever since that initial year and is attributed to the artist John Flanagan. As 2011 marks the second year for the America the Beautiful Quarters Program, the five strikes released during the year constitute the sixth through the tenth in the series overall. Those issued by the US Mint in 2011 and included as 90% silver coins in this set are briefly described below. It should be noted that silver market increases during the year forced the US Mint to suspend sales of these sets temporarily. They were returned to availability after the silver market retreated. The Gettysburg America the Beautiful Quarter features a reverse design emblematic of Gettysburg National Military Park located in the state of Pennsylvania. The park was initially created by the War Department based on legislation signed by President Grover Cleveland on February 11, 1895. Its establishment was meant as a means to preserve sites related to the American Civil War Battle of Gettysburg, which occurred at the location. The battle, fought from July 1–3, 1863, is considered the major turning point of the war as it marked the point in which Union forces began to achieve multiple victories over the Confederate Army eventually leading to the surrender of the Confederate States of America. Imagery on the reverse of the Glacier America the Beautiful Quarter showcase a portion of Glacier National Park located in the state of Montana. Glacier was initially established as a forest preserve on February 22, 1897. Its status was elevated to that of a national park on May 11, 1910 with legislation signed by President William Howard Taft. The million plus acres of the park are home to hundreds of species of plants and animals. Notable among them are the grizzly bears, the mountain goats and the easternmost forests of red cedar. The Olympic America the Beautiful Quarter honors Olympic National Park located in the state of Washington. Like Glacier National Park, Olympic was originally created as a forest preserve by President Grover Cleveland on February 22, 1897. Olympic became a national park on June 29, 1938 with legislation signed by President Franklin D. Roosevelt. Over 922,000 acres are included as part of the park which is located on the Olympic Peninsula. That location on the peninsula, with the Olympic Mountains separating it from the mainland has helped to preserve the ecosystem of the park to be much like it was hundreds of years ago. Each Vicksburg America the Beautiful Quarter honors the Vicksburg National Military Park which is located mainly in the state of Mississippi. The park was created by the War Department on February 21, 1899 to preserve and commemorate the America Civil War Battle of Vicksburg and the greater Vicksburg Campaign which led up to it. The actual battle and siege of Vicksburg was fought for forty-seven days from May 18 to July 4, 1863. The Confederate forces surrender at Vicksburg to the Union Army was also considered a pivotal turning point of the war which eventually led to a Union victory. Reverse designs on the Chickasaw America the Beautiful Quarter represent and honor Chickasaw National Recreation Area located in the state of Oklahoma. The park takes its name from the Chickasaw Indian Nation which sold the initial 640 acres for the creation of the park originally established as Sulphur Springs Reservation on July 1, 1902. Consisting of almost 10,000 acres, thousands of annual visitors partake of the activities offered within the boundaries of the recreation area. Some of those activities include boating, camping, hiking and fishing.